Synopsis: Dr. Mark Steele (Lon Chaney, Jr.) is a neurologist who uses hypnotism to cure clients of their deepest psychological traumas. In the opening scene, we see Dr. Steele cure a young woman who has been mute since a recent car crash. The girl's parents are amazed that Steele can identify the psychological root of the problem so quickly. Steele finds his work deeply satisfying; he is a wealthy and respected man, and clearly the top practitioner in his field. Yet for all his success on the job, Steele is miserable at home. His wife Maria (Ramsay Ames) makes no attempt to hide the fact that she is cheating on him: he confronts her after she returns home at 3 am, only to have her laugh in his face. She tells him that she enjoys the money and prestige that comes with being a famous doctor's wife, and for this reason will never consent to a divorce. Adding to Dr. Steele's unhappiness is the fact that he is in love with his devoted assistant, Stella (Patricia Morison). He has kept his passion for her a secret, but the next day, Steele can't help himself. He gives Stella the old "let's stop pretending" speech, and though she indicates that she feels the same way, the fact that he is married makes any relationship between them impossible. Comments: Ever have one of those Friday afternoons where you hear some upsetting news, so you get in your car and drive around, and you hear your evil wife laughing at you and see a blurry montage of dark streets and stoplights shifting around on the road ahead, and you wake up on Monday morning at your office, with no recollection of how you got there or what happened during the last few days? For me, that's just a typical weekend. 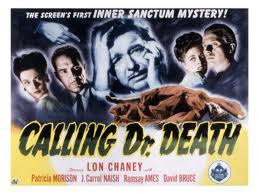 But it's a first-time occurance for Lon Chaney, Jr. in Calling Doctor Death, the second Inner Sanctum Mystery to be screened on Horror Incorporated. Chaney's Dr. Steele is very similar to Alex Gregor, the morose mentalist we met in The Frozen Ghost. And in many ways the movies themselves are quite similar: in both films he is involved with beautiful women much younger than himself. In both films everyone -- including the protagonist -- is convinced that he must have committed a brutal murder during a blackout. Thus we have Inspector Gregg wandering in repeatedly to remind Steele that his guilty conscience is going to betray him -- yes, it will -- any time now! The guy does everything but quote Dostoyevsky at him (Gregg even appears in Steele's home, presumably without a warrant, though of course this was 1943). But the biggest flaw in Calling Doctor Death is the device of Dr. Steele's lost weekend -- it doesn't make a lot of sense, since he hadn't been drinking, didn't suffer any trauma, and had no history of such episodes. The screenwriters might have been better off revealing that Steele is suffering from a post-hypnotic suggestion to block the weekend's events, which would have been a clever way to lead us to the real culprit in the third act. J. Carrol Naish seems to be enjoying himself here, channeling Edward G. Robinson as he chews the flavor out of every last line. 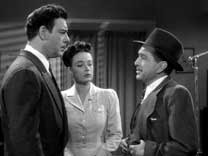 Patricia Morison, alas, doesn't get much of a chance to prove her acting chops, though pretending to be in love with Lon Chaney, Jr. must have been a stretch. Chaney himself has a part specifically tailored to his narrow acting range, and he carries the movie effortlessly. Overall, Calling Doctor Death is the kind of mystery that would have been right at home as an episode of the old Alfred Hitchcock Presents program. That show's 30-minute format would have tightened up the pace considerably. 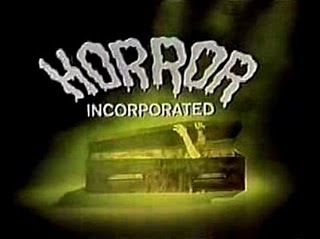 As it was, the Inner Sanctum Mysteries were really proto-television shows, their 65-minute running time the absolute minimum for theatrical release. And like television programs, these mysteries were somewhat ephemeral. They were forgotten by the cast and crew almost as quickly as they were made, and presumably forgotten by the audience almost as quickly as they were seen. Just as you, gentle reader, will forget this post almost as quickly as you have read it. The INNER SANCTUM series were a huge success at the time of release, but the concurrent radio show played a part in that. CALLING DR. DEATH was the first of the 6 picture series, and possibly the best. Director Reginald Le Borg achieves some interesting angles here, particularly when the camera "becomes" Chaney as he walks from his car to the murder scene, greeted at the door by J. Carrol Naish's prowling inspector. 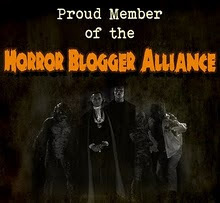 This antagonistic relationship couldn't be duplicated by Thomas Gomez (DEAD MAN'S EYES) or Douglas Dumbrille (THE FROZEN GHOST), a pair of amateurs by comparison. Only in this initial entry does the dead end investigation successfully pad out the running time, with Patricia Morison's luminous presence offering little diversion for the harried Chaney (she gave up her screen career by the 50's, concentrating on stage and television, playing the actress wife of Vincent Price on HAVE GUN-WILL TRAVEL). The second entry would be WEIRD WOMAN.